Scientists present imagery and instrument data collected by the MESSENGER spacecraft during its second flyby of the planet Mercury. India launches its first lunar orbiter, the Chandrayaan 1 spacecraft, from the country's Satish Dhawan Space Center. Atlantis was moved off pad 39A and placed inside the Vehicle Assembly Building for storage to wait out the Hubble mission delay. A Pegasus rocket carrying NASA's Interstellar Boundary Explorer launches over the Pacific Ocean. PASADENA, Calif. -- A dust storm on Mars has cut into the amount of sunlight reaching the solar array on NASA's Mars Exploration Rover Spirit, leaving the rover in a vulnerable state. 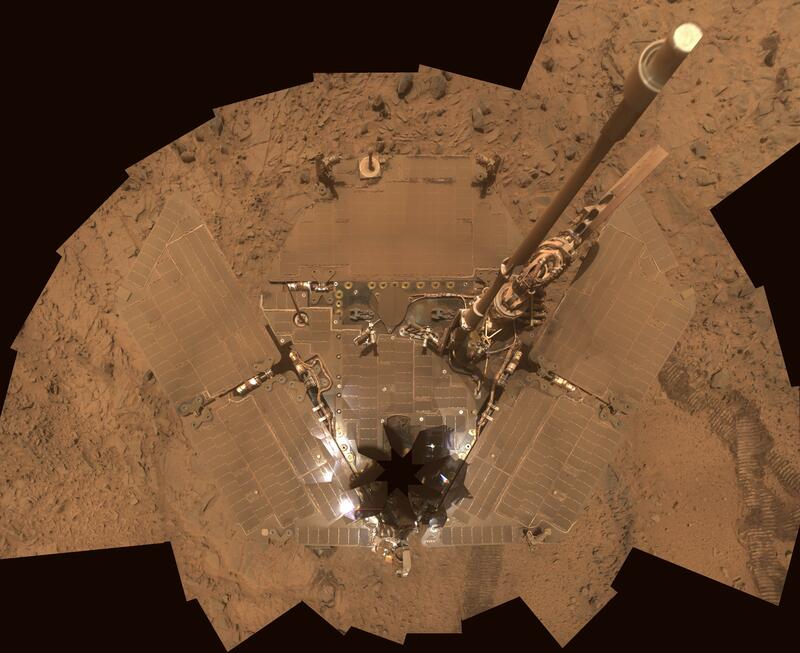 Spirit's solar array produced only 89 watt hours of energy during the rover's 1,725th Martian day, which ended on Nov. 9. This is the lowest output by either Spirit or its twin, Opportunity, in their nearly five years on Mars, and much less energy than Spirit needs each day. The charge level of Spirit's batteries is dropping so low, it risks triggering an automated response of the rover trying to protect itself. "The best chance for survival for Spirit is for us to maintain sequence control of the rover, as opposed to it going into automated fault protection," said John Callas of NASA's Jet Propulsion Laboratory, Pasadena, Calif., project manager for Spirit and Opportunity. Mission controllers are commanding Spirit to turn off some heaters, including one that protects a science instrument, the miniature thermal emission spectrometer, and take other measures to reduce energy consumption. The commands will tell Spirit not to try communicating again until Thursday. While pursuing that strategy the team also plans to listen to Spirit frequently during the next few days to detect signals the rover might send if it does go into a low-energy fault protection mode. Mars weather forecasts suggest the dust storm may be clearing now or in the next few days. However, the dust falling from the sky onto Spirit's solar array panels also could leave a lingering reduction in the amount of electricity the rover can produce. JPL, a division of the California Institute of Technology, Pasadena, manages the Mars Exploration Rover project for the NASA Science Mission Directorate, Washington.